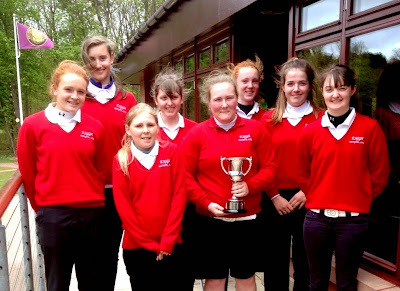 Congratulations go to 3 of our Fife County Junior Girls, Evanna Hynd, Charlene Wilson & Jenna Downie who were selected to play in the East of Scotland Girls Team to compete for the annual playing of the Mhairi McKay Trophy on Sun 10th May at Bothwell Castle Golf Club against the girls team from the West. The East Team retained the trophy by winning the match 5-3. A fantastic result for all the girls involved from all the clubs represented. Jennifer Allan, Alexandra Massey, Catherine Milne and Joanne Free.